Apply below for your EU funded IT Certification at EITCA Academy with further EITCI support available globally in the DSJC initiative. Secure your future with state of the art Digital Skills officially certified in the European Union. The cofunded European IT Certification Programme under the EITC / EITCA standard is implemented by EITCI Institute upon European Commission's Digital Skills and Jobs Coalition (DSJC) initiative as a critical commitment to further growth of the Inclusive Digital Society. Thanks to DSJC initiative the support can be now directed to all interested individuals worldwide, especially including disabled persons, pre-tertiary school students before their higher education, as well as to people living under low socioeconomic conditions. The cofunded EITC / EITCA Certification upon EITCI Institute's DSJC implementation is provided irrespective to nationality or country of residence. To qualify submit the form below setting your status as applicable. EITCI Institute's administration will evaluate your application and will contact you with further instructions on accessing your funded European IT Certification. The supportive services to your new digital skills EU Certificates will encompass free IT ID eCV competencies presentation framework as well as the EU IT Professionals networking platform access connecting European businesses with IT professionals. Learn about these platforms at EITCI Cloud and within the IT ID demo. To qualify for your funded European IT Certification enrolment, as well as for access to supportive EITCI services submit your application below. EITCI funded services are carried out under the European Commission's DSJC initiative and are not limited in access to EU citizens only, being available to anyone worldwide. After submitting of your application you can further proceed with registering your free EITCI Cloud networking platform account. Fill this form for your qualification to current and future EITCI Institute's DSJC funding of applicable fees charging. Choose your status as applicable. No special qualification entitles you to 80% to 95% cofunded EITCA Certification and free services of IT ID e-CV with DLC and EITCI Cloud. A pre-tertiary school student status (i.e. attending any school lower than a university or a college) or having disability qualifies you for free services of EITC / EITCA Certification along with IT ID e-CV with DLC and EITCI Cloud. Qualification doesn't depend on your country of residence. Low socioeconomic status (low SES) may qualify you to either full exemption from all fees on EITCI Certifications or to 95% of EITCA fees reduction in EITCI cofunding depending on the country of your residence. The European Information Technologies Certification Institute implements the European Commission's Digital Agenda for Europe upon the Europe 2020 strategy pursuing development of Inclusive Digital Society and the Digital Single Market by proliferation of high quality IT competencies in the society of the EU and abroad globally. EITCI Institute according to its mission in support of the Inclusive Digital Society development provides range of free services to individuals worldwide in areas of formal IT Competencies and Skills Certification (upon the EITC and EITCA standards), their professional IT profile presentation (upon the IT ID e-CV standard) and in connecting IT professionals with European businesses (within the EITCI Cloud platform). Learn more about the purpose of EITCI. Persons with formally confirmed disabilities are eligible to undertake any of the EITC and EITCA Certifications free of all applying fees charge. If you are a disabled person please submit the form above setting your special qualification status to person with disability and register in EITCI Cloud. Your status will be verified after registration and will remain confidential and discreet. Current students of primary and secondary education (i.e. before starting tertiary education in university or college) are eligible to undertake any of EITC Certifications free of charge. If you are a primary or secondary school student please submit the form above setting your special qualification status to pre-tertiary school student and register in EITCI Cloud. Verification of your educational status will proceed afterwards. Persons with low socioeconomic status (low SES) normalized upon surveying in regard to the current country of residence (taking into account the IMF classification), education, emplyoment and material situation. Verification of low SES will be implemented upon detailed surveying. Depending on the verification of the calculated normalized SES it may qualify to either a full exemption from all fees on all EITCI Certifications or to a range from 95% to 80% fees reduction on EITCA Certifications in EITCI cofunding. This status is confidential and discreet. If you would like to apply under the low SES status please submit the form above setting your special qualification status to low SES and register in EITCI Cloud. Verification of your status will proceed afterwards. Individuals with no special status of the above may still access cofunded EITC / EITCA Certification upon the EITCI Institute's initiative under the European Commission's Digital Skills and Jobs Coalition (DSJC) irrespective to their country of origin. To be qualified please submit the form above setting no special status and register in EITCI Cloud. After verification of your data you will be qualified to EITCI cofunded EITC / EITCA Certification upon DSJC (with no nationality / country of residence limitations). All individuals qualify for their own free IT ID e-CV and DLC. Please register here. All individuals qualify for their free EITCI Cloud account. You can register here. You can learn more about EITCI Institute and European IT Certification standards it provides from a video below. How to make sure you'll access EITCI Certification for free or if you don't qualify then in applicable cofunding? In order to be evaluated for qualification to access cofunding in EITCI Certification please submit the form above setting your qualification accordingly then register at EITCI Cloud Platform by clicking here. In case of disability or low SES your status remains fully confidential and discreet. It is possible that you will be asked to provide documentation scans or undergo surveying confirming your status admitting to a full Certification cofunding. You can register for your free IT ID e-CV by clicking here. You can register for your free EITCI Cloud account by clicking here. You can submit the form above setting no special status to access EITCI Cofunded Certification upon DSJC (with no nationality / country of residence limitation). After submiting of the form, registering of the account in EITCI Cloud will speed up your qualification procedure. We are looking forward to your participation in the EITCI Institute's European IT qualification reference standards. It doesn't matter what country you are from and whether or not it is in the European Union. EITCI Institute works internationally building Digital Society of tommorow, realizing that Digital Skills are the most empowering skills to positively shape the future. EITCI Institute proved that adhering to the highest quality standards in professional IT competencies dissemination will help moving societies forward in better understanding of their environment, science, technology, work efficiency, healthcare and even general ethics. Digital skills have much greater impact than just introducing new ways to increasing efficiency of how information is processed and communicated. This is because information is about knowledge. And knowledge is about responsibility. Pursuing development and international dissemination of high quality standards in IT competencies, EITCI Institute well understands the problems of people with all kinds of disabilities. EITCI believes that IT skills are one of most important means to at least partially overcome physical bariers related to disabilities. Therefore EITCI Institute since its conception in 2008 continues to put all our efforts in providing IT Certification services free of charge to all interested disabled persons. EITCI Institute also realizes that our future is with our children and thus pursues free IT skills dissemination and certification among school youth internationally, making all its Certification standards freely avaiable to all school youth before the tertiary education level. Additionally to accelerate growth of the Inclusive Digital Society, EITCI Institute seeks to support people of low socioeconomic status worldwide in providing a free access to high quality IT education and certification, as well as fully opens the services of IT ID e-CV along with the integrated Digital Literacy Certificate (DLC) and the EITCI Cloud European IT Professional Platform, providing these supportive services free of charge to all interested individuals globally. Finally, one of the important goals of EITCI Institute is to counter gender inequalities and disparities, especially in developing countries where the asymmetries are most pronounced. EITCI Institute understands well that a key to effective inclusion of women into modern economy with no prejudice lies in effective dissemination of IT skills and competencies especially among women to enable them taking strategic positions in globally developing Inclusive Digital Society. Since 2008 EITCI Institute implemented number of ESF funded projects aimed at developing IT competencies of women and girls in the EU. Now EITCI Institute scales this activity globally. 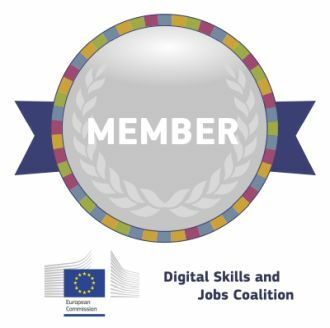 Increasing efforts in achieving its goals and supporting especially excluded social groups, EITCI Institute, as a member of the European Commission's Digital Skills and Jobs Coalition, has recently launched a pledge initiative within the Coalition. More details are available in EITCI Institute's DSJC pledge initiative and the subsidized access to EITCI Certification services is part of the activity that EITCI aims to expand, also countering gender inequalities. Learn more about the EU IT Certification from Freqently Asked Questions or from How EITCA Academy Works. Digital Skills for Your Future. Digital Skills for Your Future.